Over the last few weeks we have been discussing some of the things that the professional advertising industry use to quantify the value of an advertising location, and how and SME can leverage this knowledge and experience to work out where best to site their screens for maximum impact. After all you want to get the best ROI possible from your investment in digital signage so it makes sense to place the screens in the best possible locations available to you. Landing Zone – Think long and hard about placing screens immediately in the entrance to your environment as people are less likely to notice the messages on a screen in this location. Cone of Vision – Try and place screen as close as possible to the center of your audience’s center of vision. The further you go off axis the less likely the screen will get looked at. This is especially important for a moving audience. Clutter – Think about what other ‘visual clutter’ is around the proposed screen location which will also be vying for the attention of the audience. You can only look at one thing at a time. Time of exposure – Not to be confused with dwell time, but rather how long will an audience look at a screen for a particular amount of time. This should dictate the optimum length any one piece of content should be. Dwell time – How long will an audience be dwelling around a screen. For example in say a busy restaurant area an audience may be sat eating for 20 minutes (the dwell time), but if they are busy eating and holding a conversation they may not look at the screen for a long period (Exposure time). Dwell time should dictate the optimum length of a playlist, not forgetting OTS (Opportunity to see). 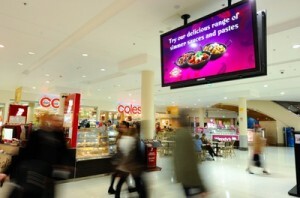 Content – At the end of the day the best placed, top of the range screen powered by the best digital signage software money can buy is nothing without appropriate & relevant quality content to place on the network. Your 35 minute corporate powerpoint presentation may not cut the mustard after all !! Hopefully using these tips may allow you to find the best location for your screens. Or even decide that some locations are best served by not having screens at all. Of course Dynamax and our network of System Integrators are happy to work with our customers to advise on the best strategy for screen placement and content strategy. This entry was posted in Digital Signage, Marketing and Advertising, Tips and advice and tagged advertising, digital signage, digital signage advertising by hsmith. Bookmark the permalink.